Writing a long document sometimes feels like a balancing act. You can't just load Notepad and bang it out top to bottom, but if you use a word processor you can quickly become mired in formatting and details. Substance is a free, open-source Web app that offers a different approach: structured content-oriented writing. That's a mouthful, but basically it means that you get to focus on the text and structure, without thinking too much about the formatting. Since Substance is focused on authoring, it has just one theme, but it makes documents look stylish. Although Google Docs, Microsoft Office Web Apps, and Zoho all offer solid Web-based word processors, they are still word processors. Other approaches to authoring documents online include wikis, such as DokuWiki or MediaWiki (which Wikipedia uses), but they often employ special syntax and are not always visually appealing. Structure does not offer much in the way of formatting options, but it is absolutely gorgeous, and it makes just about anything you write seem intelligent. Structure uses a pale color scheme, with a large white page containing your text. To the left is a dynamic table of contents that grows as you add new sections to your document and indicates the currently active section. You can invite other people to collaborate with you--but unlike Google Docs, Substance does not support live, concurrent editing. It does have multiuser features: For instance, Substance maintains a profile page for every user, where others can read documents that the user has published. You can explore the Substance server and see what other people have published, but it offers no way to filter documents by language, and many of the documents are in German. Your document consists of blocks of several types: section markers (new chapters), text blocks, image blocks, resources, quotes, and code snippets. You can enter code snippets in several different programming languages, and once you tell Structure which language you're using, it syntax-highlights your code. Other types of content are not as obvious: For example, a "resource" snippet expects a URL, but this feature did not work in my tests, as it considered all the URLs I entered to be invalid. Substance is a work in progress, and a few other things didn't behave as I expected. The most important feature that didn't work when I first tried it was the export of my document. Substance allows you to export your work into numerous formats, such as PDF, HTML, Markdown, RTF, and more--but when I tried exporting, nothing happened. Substance author Michael Aufreiter restarted the server when I reported this issue, and export started working again. As it stands, Substance shows great promise, but is not yet usable for daily work. 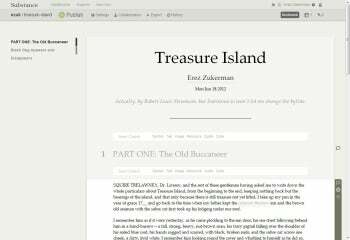 It is one of the most stylish authoring systems I've seen to date, and it makes writing fun. It is free, and you can install it on your own server for maximum privacy. Once its creators iron out the kinks, it might offer a lovely way to write online. You can author long-form texts on your own or with collaborators in Substance's stylish online environment.